Typical Victorian terraced houses in England, built in brick with slate roofs, stone details and modest decoration. In Great Britain and former British colonies, a Victorian house generally means any house built during the reign of Queen Victoria. She was the ruler of England from 1837 to 1901. 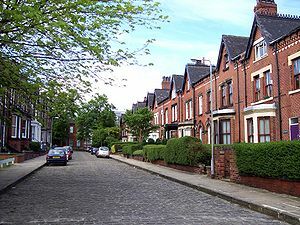 During the Industrial Revolution, successive housing booms resulted in the building of many millions of Victorian houses which are now a defining feature of most British towns and cities. In the UK, Victorian houses follow a wide range of architectural styles. Starting from the early classicism inherited from Regency architecture, the Italianate style gained influence in the 1820 and 1850s, and the Gothic Revival style became prevalent by the 1880s. Later in the Victorian era, the Queen Anne style and the Arts and Crafts movement increased in influence, resulting in the transition to styles typically seen in Edwardian houses. Victorian houses are also found in many former British colonies where the style might be adapted to local building materials or customs, for example in Sydney, Australia and Melaka, Malaysia. Early in the Victorian era, up to the 1840s houses were still influenced by the classicism of Regency styles. However the simplicity of Regency classicism fell out of favour as affluence increased and by the 1850s the Italianate style influenced domestic architecture which now incorporated varying quantities of stucco. From the 1850s domestic buildings also became increasingly influenced by the Gothic Revival, incorporating features such as pointed, projecting porches, bay windows, and grey slate. Victorian houses were generally built in terraces or as detached houses. Building materials were brick or local stone. Bricks were made in factories some distance away, to standard sizes, rather than the earlier practice of digging clay locally and making bricks on site. The majority of houses were roofed with slate, quarried mainly in Wales and carried by rail. The clay tiles used in some houses would be available locally. In Victorian times, population growth, and the Industrial Revolution which saw a migration of workers from the countryside to the cities, resulted in successive housing booms in the 1850s and 1870s that saw the creation of millions of houses. These catered not only for the rich and the new "middling-classes" but also for the poor. In deprived areas, Victorian houses were often very small, for example, back-to-back houses built in extremely cramped conditions. Some of these areas became slums or 'rookeries', and were later cleared. Some smaller, two-up two-down houses still survive, for example in Salford, Greater Manchester. Victorian houses for the middle classes and upwards tended to have accommodation for servants, often employed to carry out the considerable labour required to keep the house, including its fireplaces, clean and well stocked. Victorian houses of the middle and upper classes aspired to follow the purest forms of contemporary architecture, for example, the Gothic Revival or Queen Anne styles. Victorian-era homes in eastern American cities tend to be three stories and those in western American cities tend to be two-story houses or one-story cottages. This is not representative of a typical Victorian-era home in all regions. Although the general public often incorrectly refers to a Victorian-era house as a Victorian-style house, Victorian era refers to a time period and not to a style. Although architectural historians generally agree that about eight primary architectural styles were prominent in the United States and Canada during the Victorian era, Victorian-era residential architecture in the United States and Canada was a procession of styles borrowed from countries and historical styles. "High execution" of U.S. Queen Anne style: The Carson Mansion located in Eureka, California. This is an 1880s photo of 653 W Wrightwood (now 655 W Wrightwood) in Lincoln Park, Chicago, Illinois. Note the wooden sidewalk, dirt road and lack of buildings surrounding the edifice. The Abbey, Annandale, New South Wales (Free Gothic). ^ a b c d e Marshall, John; Willox, Ian (1986). The Victorian House. London: Sidgwick and Jackson Limited. ISBN 0-283-99363-4. ^ Pragnall, Hubert (1984). Styles of English Architecture. Frome: Batsford. ISBN 0-7134-3768-5. Larsen, Michael; Elizabeth Pomada; Photographs by Douglas Keister (1987). Daughters of Painted Ladies: America's Resplendent Victorians. New York: E. P. Dutton. ISBN 0-525-48337-3.